If you want to totally transform your outdoor space, then call the best artificial grass and synthetic turf landscape designer company in San Diego to inquire on the different artificial turf applications offered by our company. Our artificial turf services are perfect for you. Whether it’s replacing the patio, sprucing up your rooftop, or even surrounding the pool, there’s something for everyone at San Diego Artificial Grass. Make your outdoor living space more functional, and take advantage of one of our many innovative solutions today, by embracing synthetic turf to the fullest. San Diego Artificial Grass can be used in so many ways, for both commercial and residential properties. It’s an excellent alternative to decking or tiling, as it requires far less maintenance than other materials. We’ve seen plenty of commercial clients using synthetic turf to great effect both indoors and out, too, to create jaw-dropping entertainment areas and rooftop gardens where they can impress their clients. We also offer custom shade sails and tree well surfacing for commercial and residential applications. Residential roof decks – No need for weather-proofing, and lasts much longer than most decking materials. 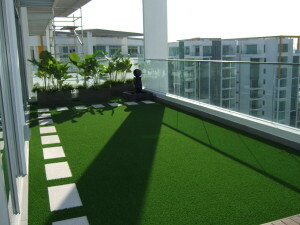 Terrace and Patio – Experience the pleasing feel of green grass, and avoid that boring concrete look. Commercial Rooftops/roof-decks – No space? No problem! Create a natural looking garden on your roof to give you a friendly, calming retreat from the world. Environmentally Friendly- Save plenty of water, and avoid the use of harmful pesticides. Lasting up to twenty years, our artificial turf lowers your carbon footprint significantly. Perfect for Pets- Artificial grass is a great place for pets to play on, and can help to reduce the risk of fleas and ticks spreading to others. Great for Parties- Your terrace, patio, or decking area can be totally transformed into a spectacular area for hosting guests and getting up to all sorts of fun activities. Custom Projects- Whether it’s playground safety surfacing, shade sails or putting greens, our expert installers are ready to tackle any project. Lightweight- Artificial turf is light, so it’s ideal for older buildings whose roof might not take a heavier material. How great would it be to be able to practice your putting day or night, without having to leave the house? At San Diego Artificial Grass, that’s exactly what we can offer you, with our amazing synthetic turf putting greens. We provide only the best quality artificial turf, to give you top performance at all times. It looks and feels just like a professional putting green, at just a fraction of the cost. What’s more, it’s also a great way of spending more time with your family doing something you love. 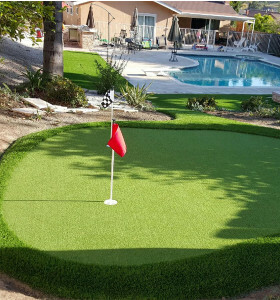 At San Diego Artificial Grass, we can put together the perfect synthetic turf golf putting green for you, with only the finest artificial turf. Just get in touch today to make an incredible difference to your short game, right in the comfort of your own home! We understand how important your kids’ safety is to you, which is why we think artificial turf I the way to go. Prevent injuries from hard or abrasive terrain by having our playground safety surfacing installed, and ensure that all children in your playground are safe from falls, scrapes, and other mishaps. It just makes sense to use synthetic turf, and help keep the next generation playing safely. Get in touch with the best artificial grass and synthetic turf landscape designer in San Diego today, and we will set up a completely free, no obligation consultation at a time that suits you. Just fill out the contact form, or alternatively call us direct. We will come to you and talk you through all the different options and prices available to you. What’s more we guarantee 100% customer satisfaction. Contact us now for a free artificial grass estimate to learn more about all that we have to offer when it comes to artificial turf. Do you need a landscape designer to design your landscaping to install artificial turf? The short answer is, No. Even though we are not designers by trade we can help you design and install artificial grass in your home or business and save you thousands of dollars in designer’s fees in the process. We are experienced in helping clients design the landscape of their dreams. Do you remember the term “Astroturf” when artificial grass wasn’t that popular? Synthetic Turf or Artificial Grass is the more common term used when describing fake grass nowadays. There are many companies in San Diego that claim to be the best, but buyer beware. There are many synthetic turf contractors that are not licensed, bonded or insured and are quick to take your money. Be sure they have a current license issued by the CSLB (California State Licensing Board). Installing artificial grass nowadays is much more affordable than turf available years ago. You do not need a landscape designer, architect or landscape contractor to design and install the turf for your home or commercial business. If you want a professional installation for your apartment, condo / condominium, house, business or vacation rental then give us a call to schedule a free estimate. Our consultant will work with you to provide green, low water, low maintenance, drought tolerant, water friendly, water wise, smart and efficient landscape design ideas to conserve water for your front yard, backyard, side yard, patio or dog run. We try to use organic, natural and sustainable products whenever possible. 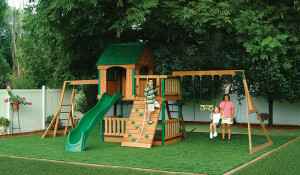 Out turf installation experts also install backyard golf putting greens and playground turf. Our company has many positive reviews and testimonials online on sites like Yelp, Google, and Facebook. We pride ourselves in being efficient and providing quality turf installation services. We only use quality supplies from reputable dealers with the best warranties and guarantees in the industry. We offer free estimates throughout North, South, East, West / Coastal San Diego County. We are professional artificial grass lawn care maintenance service. Once synthetic turf is installed the only thing you should really do is lightly rinse it once in a while to remove dust and other debris from the fibers. If a more thorough synthetic grass cleaning is needed use a broom with thick bristles to brush off leaves or trash from your fake grass. Grooming your lawn with a thick bristle brush will also help keep the turf blades upright, looking full and plush like real grass. We are the best artificial turf synthetic grass installers in San Diego Ca. If you’re looking where to buy or get a quality turf installation you’ve come to the right place! We don’t have cheap turf for sale and only carry the best top rated artificial grass for a backyard golf putting green, for dogs / dog runs, pet turf, front yards, backyards, patios, playgrounds and more. We also repair existing turf. You may be asking what is the cost or how much is it to install? Our prices are very fair and reasonable compared to other turf companies. We are not wholesale liquidators, sell used remnants or recycled turf. We only install new high-quality turf. With us your lawn will look amazing! If you’re looking how to install synthetic grass, we may not be the best fit, but we can get you in the right direction. We install artificial grass in North, South, East and West / Coastal San Diego County. We have many positive customer reviews and client testimonials in Yelp, Google and Facebook.